Major roadworks have been underway in Brighton, along the route that I take from the city centre to my workplace at the Falmer campus of the University of Sussex, for about four months from mid-August until just recently. These works are to do with “improvements” to the Vogue Gyratory system, a complex junction involving the main road between Brighton and Lewes (the A270/A27 Lewes Road) and three other roads: Bear Road, Hollingdean Road and Upper Lewes Road. 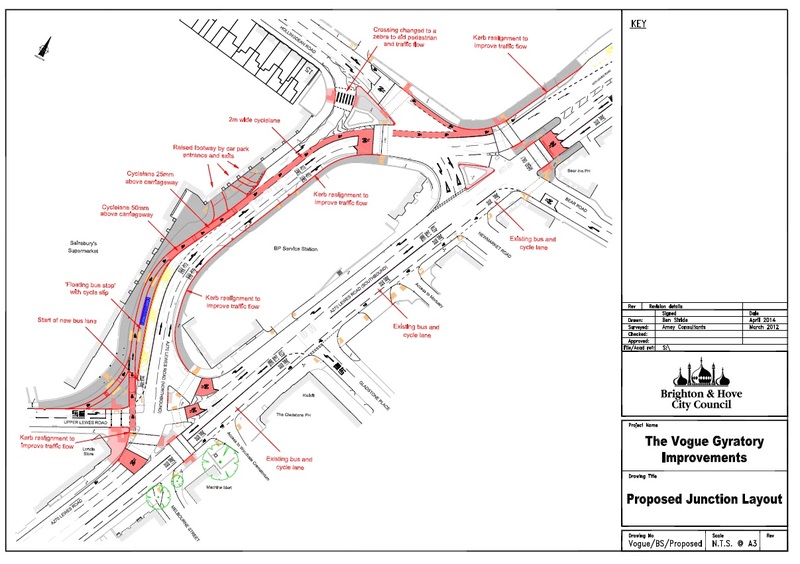 The aims of this scheme are apparently to improve traffic flow through the junction, and to make it safer for cyclists. The latter objective is addressed by changing the bus stop which was originally just outside Sainsbury’s (to the left of the plan) into a “floating” stop and putting a cycle lane behind it. These floating bus stops have been deployed further up the Lewes Road to good effect; cycles pass behind the bus stop so there is no need for them to attempt to overtake buses which have stopped and no need for buses to wait for cyclists passing the stop before pulling in to pick up passengers. The only problem is that pedestrians have to cross the cycle laneto get to the bus stop, and they sometimes do so without paying sufficient attention. There has therefore been an occasional collision between people on foot and people on bikes. Nevertheless these floating stops have largely been successful and I think are a good idea from Brighton and Hove City Council. This is no doubt why they decided to apply the same principle to the bus stop in the Vogue Gyratory. Unfortunately, the new scheme is not safer for cyclists at all. In fact it’s a death trap. Don’t take my word for it: on one day last week there were three accidents as a direct result of the changes and another just hours later. These incidents were all caused by the introduction of a hidden kerb at the edge of the cycle lane. All four victims fell off their bikes and could easily have been killed by motor traffic as a result. The hidden kerb is clearly a piece of idiocy, but can perhaps be easily fixed. But there is a far greater danger lurking in the new system. Imagine you are in a car, entering the gyratory from the southern end (bottom left of the plan) and intending to exit up Hollingdean Road (near the top). If a bus has stopped at the floating bus stop it will completely hide the cycle lane and cyclists on it until the car has passed the stop. However, almost immediately after the stop a car wishing to take an exit left has to cross the, totally unprotected, cycle lane. There are no signs to warn motorists to beware of cyclists coming from their left, no barriers and no lights. This is what traffic planners call a “point of conflict” and the current design of the junction makes this a potentially lethal one, which is exacerbated by the “improved traffic flow” through through the junction, which means that cars often travel at quite high speeds along the main carriageway. A serious accident, possibly even a fatality is just a matter of time. People have suggested that car drivers should know where cyclists are likely to be, but what about a driver who is using the junction for the first time? You can’t expect motorists to be psychic. So what can be done? It’s hard to see how such a basic design flaw can be fixed without rebuilding the entire junction, but two immediate steps must be taken before somebody dies. The first is to reduce the speed limit for all vehicles through the junction to 5 mph. 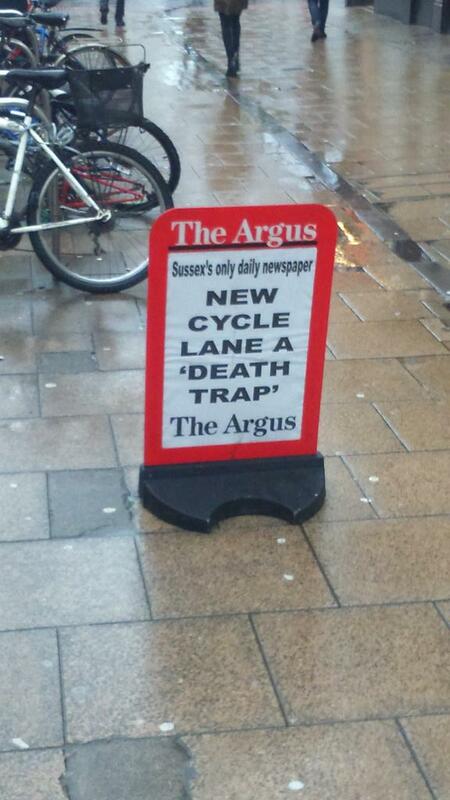 That may just give drivers the time to notice cyclists immediately to their left. The second is to introduce much more obvious warnings. The problem with the second of these is where to position the required signs. There’s no point placing them on the island forming the floating bus stop because they would be hidden too. Perhaps there could be overhead signs? The disruption that the Vogue Gyratory roadworks have caused has been horrendous: four months of almost continuous gridlock and the time taken for my daily trip to work almost doubled. This is in itself shows a disgraceful failure of planning. The area is not primarily residential, so they should have worked at weekends and possibly even round-the-clock to mitigate the impact. I’ve been completely exasperated on a number of occasions as the bus I was on inched up the Lewes Road tailback only to enter the Gyratory and find no work at all going on. I don’t think there was a proper estimate of the disruption the works would cause nor was any reasonable plan made to mitigate it. Now we find out that all this agony will have to be repeated in order to put right what should have been obvious to the planners, especially the failure to recognize the poor visibility of cyclists through the gyratory. There should really be a public inquiry about this fiasco, but I think that will only happen if there is a serious accident. If that does occur, then the relevant employees Brighton and Hove City Council should be facing charges of criminal negligence or even manslaughter. Polls close at Midnight on Monday 22nd. It seems I even have a chance of winning! But whatever the finish, you can bet it won’t be smooth! And so it seems! During the course of today Conchita Wurst has romped into the lead! The Beard Liberation Front, the informal network of beard wearers, has said that with the final weekend of voting for Beard of the Year 2014 underway, the poll looks set to get hairy. The final weekend usually sees peak voting patterns and this year is expected to be no different. Already around a 1000 people have cast their vote and many more are expected to do so in the next 3 days. That Was The REF That Was.. I feel obliged to comment on the results of the 2014 Research Excellence Framework (REF) that were announced today. Actually, I knew about them yesterday but the news was under embargo until one minute past midnight by which time I was tucked up in bed. The results for the two Units of Assessment relevant to the School of Mathematical and Physical Sciences are available online here for Mathematical Sciences and here for Physics and Astronomy. 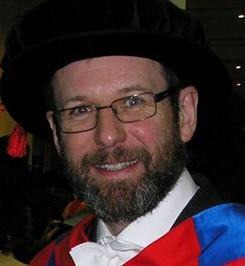 To give some background: the overall REF score for a Department is obtained by adding three different components: outputs (quality of research papers); impact (referrring to the impact beyond academia); and environment (which measures such things as grant income, numbers of PhD students and general infrastructure). These are weighted at 65%, 20% and 15% respectively. Scores are assigned to these categories, e.g. for submitted outputs (usually four per staff member) on a scale of 4* (world-leading), 3* (internationally excellent), 2* (internationally recognised), 1* (nationally recognised) and unclassified and impact on a scale 4* (outstanding), 3* (very considerable), 2* (considerable), 1* (recognised but modest) and unclassified. Impact cases had to be submitted based on the number of staff submitted: two up to 15 staff, three between 15 and 25 and increasing in a like manner with increasing numbers. The REF will control the allocation of funding in a manner yet to be decided in detail, but it is generally thought that anything scoring 2* or less will attract no funding (so the phrase “internationally recognised” really means “worthless” in the REF, as does “considerable” when applied to impact). It is also thought likely that funding will be heavily weighted towards 4* , perhaps with a ratio of 9:1 between 4* and 3*. To take the Department of Physics and Astronomy, as an example, last year we increased staff numbers from about 23 to about 38. But the 15 new staff members could not bring any impact with them. Lacking sufficient impact cases to submit more, we were obliged to restrict our submission to fewer than 25. To make matters worse our impact cases were not graded very highly, with only 13.3% of the submission graded 4* and 13.4% graded 3*. The outputs from Physics & Astronomy at Sussex were very good, with 93% graded 3* or 4*. That’s a higher fraction than Oxford, Cambridge, Imperial College and UCL in fact, and with a Grade Point Average of 3.10. Most other departments also submitted very good outputs – not surprisingly because the UK is actually pretty good at Physics – so the output scores are very highly bunched and a small difference in GPA means a large number of places in the rankings. The impact scores, however, have a much wider dispersion, with the result that despite the relatively small percentage contribution they have a large effect on overall rankings. As a consequence, overall, Sussex Physics & Astronomy slipped down from 14th in the RAE to 34th place in the REF (based on a Grade Point Average). Disappointing to say the least, but we’re not the only fallers. In the 2008 RAE the top-rated physics department was Lancaster; this time round they are 27th. I now find myself in a situation eerily reminiscent of that I found myself facing in Cardiff after the 2008 Research Assessment Exercise, the forerunner of the REF. Having been through that experience I’m a hardened to disappointments and at least can take heart from Cardiff’s performance this time round. Spirits were very low there after the RAE, but a thorough post-mortem, astute investment in new research areas, and determined preparations for this REF have paid dividends: they have climbed to 6th place this time round. That gives me the chance not only to congratulate my former colleagues there for their excellent result but also to use them as an example for what we at Sussex have to do for next time. An even more remarkable success story is Strathclyde, 34th in the last RAE and now top of the REF table. Congratulations to them too! Fortunately our strategy is already in hand. The new staff have already started working towards the next REF (widely thought to be likely to happen in 2020) and we are about to start a brand new research activity in experimental physics next year. We will be in a much better position to generate research impact as we diversify our portfolio so that it is not as strongly dominated by “blue skies” research, such as particle physics and astronomy, for which it is much harder to demonstrate economic impact. I was fully aware of the challenges facing Physics & Astronomy at Sussex when I moved here in February 2013, but with the REF submission made later the same year there was little I could do to alter the situation. Fortunately the University of Sussex management realises that we have to play a long game in Physics and has been very supportive of our continued strategic growth. The result of the 2014 REF result is a setback but it does demonstrate that the stategy we have already embarked upon is the right one. What lasting hell for these who try as authors? Only the monstrous anger of the dons. Can patter out career horizons. And lost opportunities calling them from sad HEIs. What meetings may be held to speed them all? Shall shine the unholy glimmers of goodbyes. As I mentioned in my previous post, yesterday evening I attended the opening of a new show at the Fondation Louis Vuitton in Paris. The first thing to say is that the Fondation Louis Vuitton building, designed by Frank Gehry, is an absolutely amazing structure. It was dark and rainy when I arrived there yesterday and I failed to get any decent pictures of the outside but if you google around you will see what I mean. The interior of the building is an extraordinary as the outside; indeed, it’s such a complex topology that the distinction between inside and outside gets completely lost. It’s definitely a work of art in its own right and enormous fun to wander around, although some of the terraces and balconies are not suitable for those of us who are afraid of heights especially since the only barriers are transparent. 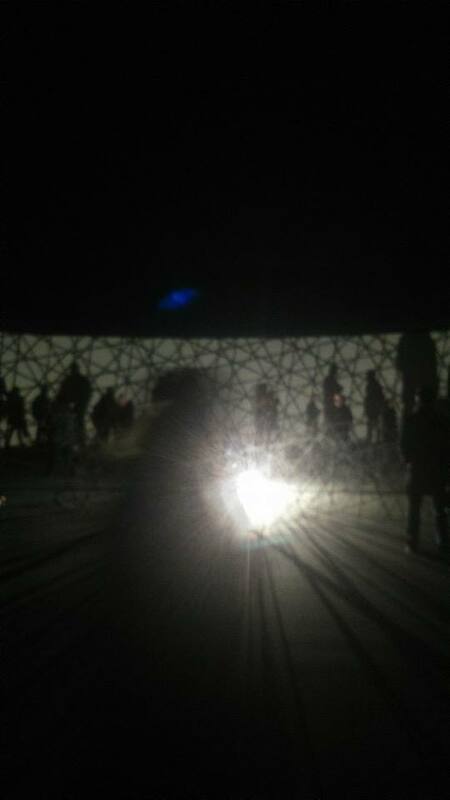 Anyway, the installation I mainly went to see, by Olafur Eliasson, called Contact, is built around two large spaces on the lower ground floor of the Fondation Louis Vuitton building. The first room is semi-circular in shape and darkened. Along what would be the diameter were it a full circle there is a mirror, just in front of the centre of which there is a bright light surrounded by metallic structure in the form of a mesh. The light illuminates a strip of the circular wall, with darkness above and below, and not only casts a shadow of the mesh against the curved wall but also does the same for the people in the room. The radius of the semicircle is about 25 metres so the room can accommodate many people. First impressions entering this space are quite strange. 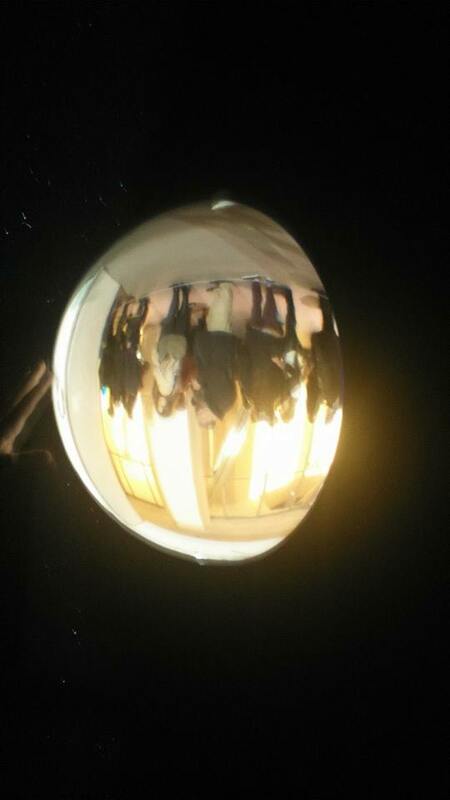 First, the room seems to be exactly circular. 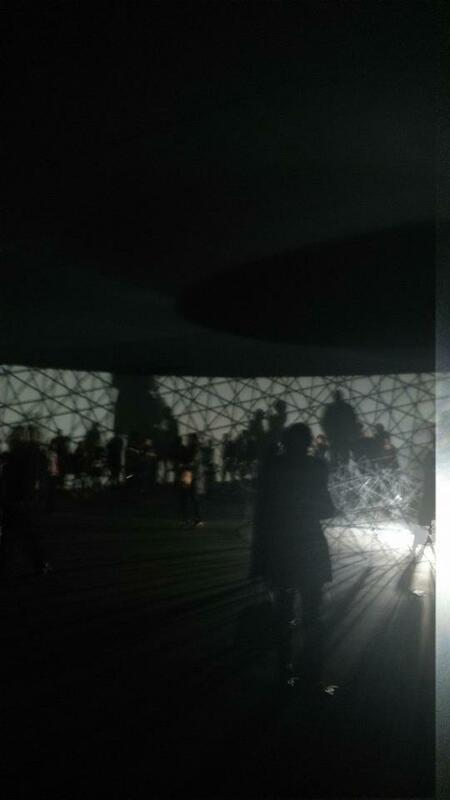 Then you realise there is a mirror and the mixture of geometrical and human shadows on the circular section of wall. 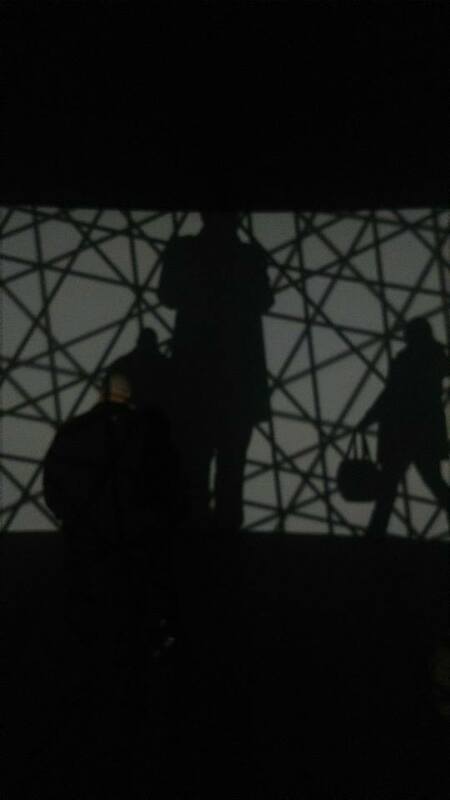 Once you have taken in the true geometry, however, there is stull the fun of watching how people behave within it. 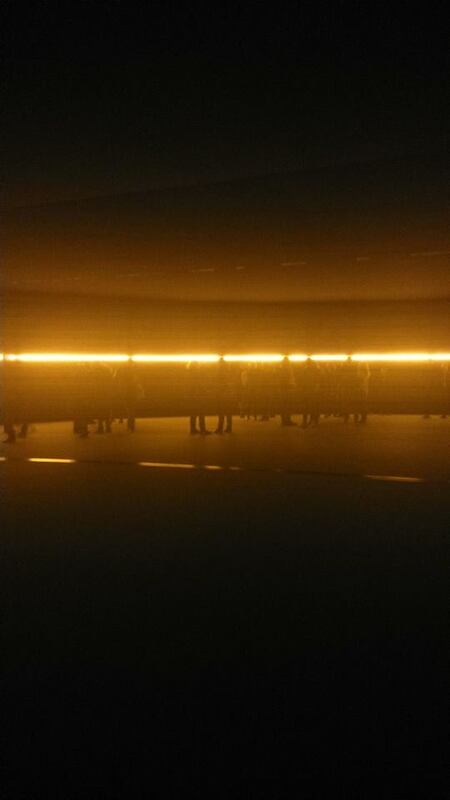 Like many of Olafur’s works, this one is as much created by the people who enter the room as it is by the artist. The second room is a quadrant rather than a semicircle, with mirrors along the two straight edges creating the impression of a complete circle. 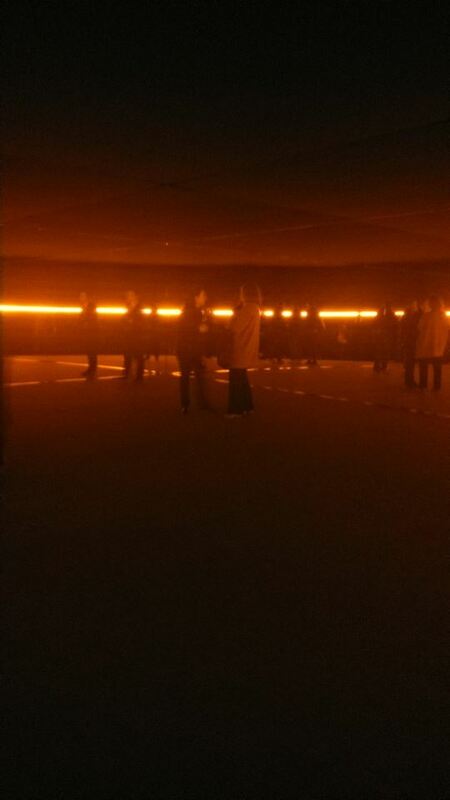 This time, instead of a single point of light in the centre there is a horizontal illuminated stripe of an intense orange-red which, in the mirrors, creates in the viewer the impression of being in the middle of a ring of light. This is evocative of attempts that have been made from time to time to construct cosmological models with a compact topology, such as a finite flat space with its edges identified to form a torus. In between these two large spaces there are a number of smaller pieces involving curved mirrors devices that invert and otherwise distort the images of people moving around inside the exhibition, one in particular producing an amazing holographic effect. Knowing how these things work does not diminish their power to amaze and to make you want to reach out and try to touch what is not really there.. Anyway, that’s all just a taster. You really have to see it to appreciate it. It’s a show that asks very interesting questions about we use light in order to perceive space and indeed how we construct space itself through our own imagination. Well, here I am in a misty and murky and rather cold Paris. My first trip on the Eurostar from St Pancras as it happens. I’ve used the train to get to Paris before, but the last time was a long time ago when it departed from a temporary station at Waterloo. Anyway, there’s a direct train from Brighton to St Pancras International. Although it was about half an hour late, I still had time for a bite to eat before boarding. The train was pretty full, but ran on time and I got into Gare du Nord just before 4pm local time. A short (and inexpensive) trip on the Metro brought me to the hotel where I’ll be staying the night. There is a conference going on in Paris this week about Planck but that’s not why I’m here. 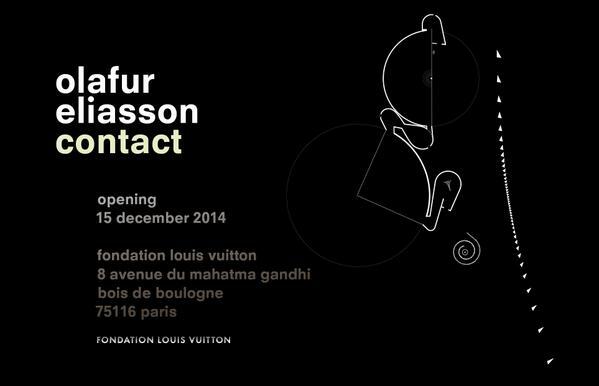 In fact I’m attending the opening of “Contact”, an exhibition by Olafur Eliasson at the Fondation Louis Vuitton. I was toying with the idea of combining this event with the Planck meeting, but (a) I’ve got too much to do to stay for the whole week and (b) I don’t think there’ll be much new at the Planck meeting anyway. Anyway, Olafur very kindly asked me to write something for the catalogue, as the exhibition has something of an astronomical theme and I guess that’s why I got the VIP invitation. There’s something called a cocktail dinatoire afterwards which I presume involves large amounts of alcohol. That may fortify me for the impending REF results, which are due out later this week.. Anyway, I’ll post about the exhibition if I get time tomorrow morning before the journey home. It doesn’t open for the general public until Wednesday 17th December, by the way, in case you’re in Paris and thinking of taking a look for yourself.